Cucumbers are very much a part of our daily diet and there is hardly anyone who does not keep it in the vegetable or fruit basket at home! Salads are absolutely unimaginable without this cool green fruit to crunch on! But did you know it can be one of the most cost-effective options for your skin diet? Its cooling and hydrating properties make it one of the most wonderful ingredients for nourishing your skin and catering to your beauty needs. • Cucumber for puffy eyes: This is perhaps one of the best known beauty applications of cucumbers. Since cucumbers contain ascorbic acid in huge quantities, it prevents retention of water. Just place slices of cucumbers on your eyes and leave it for about fifteen minutes. The puffiness would be gone. • Cucumber for tired eyes and dark circles: If you are unhappy with the expensive serums that promise to remove dark circles, try using cucumbers. The silica and anti-oxidants that cucumber has helps in lightening dark circles and rejuvenating dull and tired eyes. You can also use potato juice in equal quantities with cucumber juice to do away with dark circles faster. • Cucumber for skin problems: The cooling properties of cucumbers help to soothe inflammations and treat rashes. 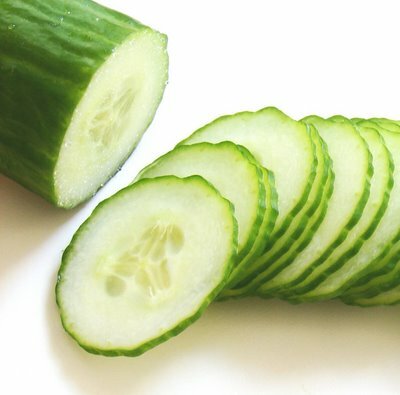 Place thin cucumber slices on affected area to treat irritated skin conditions. In no time, you would feel better. • Cucumber for treating pimples: Cucumber is known to work wonders on pimples as well as blackheads. Apply cucumber juice on skin and let it dry. Wash off with plain water. The astringent properties would help to reduce pimples and acnes. Your skin would be smooth and soft naturally. • Cucumber for treating sunburn: Cucumber is a natural coolant, excellent for treating sunburns. It reduces pain and helps to heal the skin thus damaged. Apply cucumber juice directly on skin or place slices on the affected areas to get the best results. • Cucumber for cleansing: It is a deep pore cleanser which gives you bright skin when used daily. The water content of cucumbers helps to clean the pores gently and offer you healthy skin. • Cucumber as anti-aging remedy: Cucumber contains 90% water and thus, helps to keep your skin hydrated. Cucumber seeds are rich in vitamin E and potassium. The seeds help in reducing fine lines, spots and other signs of aging. • Cucumber for weight loss: The calorie content in cucumbers is low and therefore, it is a great substitute for snacks loaded with calories. Since cucumbers have dietary fibers, it checks your tendency to over-eat. Your stomach feels full and you tend to eat less. Thus, it is a healthy way to spur weight-loss. Cucumbers offer multiple benefits when used in face packs. Grated cucumber or cucumber juice can be used as a key component in facial masks to treat wrinkles, spots, blemishes, pimples and fine lines. Cucumber is also suitable for sensitive skin. • Cucumber-Egg white pack: Blend a few cucumber pieces in a blender and form a smooth paste. The paste needs to be strained so that the juice is separated from the residue. Now mix the juice with an egg white and a spoon of lemon juice. Leave it on for about twenty minutes and rinse with cold water. • Cucumber- Oates pack: Make a paste by blending cucumber slices. Add some honey and yoghurt. Add half-a-cup of oats. Put it in the refrigerator and apply the pack when it is cold. Wait till it is dry and rinse with clean water. If you have a dry skin, you can use milk instead of yoghurt. • Cucumber-Almond face pack: Mix a spoon of grated cucumber with half-a-spoon of almond powder, a spoon of cold milk and honey. Apply it on your face and keep for twenty minutes. Wash off this nourishing face mask with lukewarm water. • Cucumber-milk pack: Mix equal quantities of cucumber juice with milk and apply it on your face to tighten the skin pores. • Cucumber-lemon pack: Mix cucumber juice and lemon juice in equal quantities and apply the concoction on your face. Keep for about fifteen minutes and rinse with water. This pack helps to lighten your complexion. nice article somreeta….i have 1 query…….can v apply cucumber juice directly on face or with water???? Megha you can directly apply the juice on your face !! It has cooling and nourishing effect without being strong.